Festival organizers for KAABOO Del Mar have not only revealed the day-by-day line-up–which includes the addition of Switchfoot and Neon Trees–for the inaugural event, but they’ve found another way to cater to an audience of sophisticated concert-goers. The latest offering, KAABOO 4 U (#KAABOO4U), allows guests to create customizable entry packages, which includes every combination imaginable: single day and two day passes (with the ability to pick any two days of the three day event), along with the traditional three-day weekend option. KAABOO 4 U passes go on sale today (Tuesday, June 23 at 10:00 AM PT) with single day prices starting at$125 (full breakdown of pass options is below). Throughout the KAABOO weekend, music aficionados will experience an unforgettable three days of performances on seven stages and six unparalleled experiences: Humor Me, Palate, Indulgences, ArtworK, Encore, and Posh Nosh. 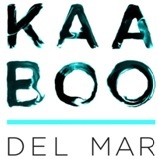 KAABOO Del Mar–Friday, September 18-Sunday, September 20 at the Del Mar Racetrack & Fairgrounds–is presented in partnership with Mercedes Benz. Just steps away from the Pacific Ocean, the KAABOO site is situated within a few hours of all major Southern California cities. KAABOO Del Mar prices are as follows: GA Hang Loose prices are $125 for single day, $229 for two day (any two day combination), and $299 for three day; Hang Five VIP passes are $299 for single day, $575 for two day, and $799 for three day. In addition, a limited number of KAABOO HANG FIVE and HANG TEN VIP luxury on-site accommodations remain available. All VIP accommodations include access to the private Oceanfront Oasis lounge with pop-up performances and dedicated Oasis Concierge service. Onsite accommodations include two deluxe options: Seascape Luxury RV (two-five guests) or Surfside Luxury Tour Bus (two-eight guests) packages, all of which will be situated in Oceanfront Oasis, set in the legendary racetrack’s infield. Prices start at $6,780 and require a minimum of two guests. To make your reservation and view a full list of pricing options, please visit the KAABOO website or contact KAABOO Hospitality Guest Services: (888) 805-8930 or email: oasis@kaaboodelmar.com. All three-day VIP passes include entry to a Thursday pre-event, invitation-only celebration with musical performances from Sheryl Crow and Ed Kowalcyzk (founding member and former lead singer of the band, Live). In addition, the Hang Ten VIP pass at $2499 per pass (includes all of the Hang Five VIP benefits) also offers complimentary food and beverages in designated areas, access to the KAABOO Artist Lounge (11:00 AM-10:00 PM) and Oceanfront Oasis (9:00 AM-12 Midnight) on the track in-field, complimentary valet parking, elevated gift bag; access to offsite excursions and on site activities (prices vary based on activity) for surfing and yoga; exclusive pop-up performances/sessions and meet & greets with performers and participants in the Oceanfront Oasis from KAABOO‘s six unparalleled experiences; and a dedicated platinum viewing at three stages (inclusive of the main stage), dedicated “Hang Ten” pre-event planning support and on-site concierge service. Meanwhile, $1 from each pass purchased will go to the “KINDNESS” charity program, created by KAABOO organizers benefiting four local charities. The funds raised will be divided equally among the charity partners for support of programs directly impacting the local San Diego community. When purchasing passes, guests will be given the option of donating additional funds, with KAABOO matching each donation, dollar for dollar. The “KINDNESS” partners include: Feeding America San Diego (feedingamericasd.org), San Diego Armed Services YMCA (www.sandiegoasymca.org), San Diego Music Foundation (sandiegomusicfoundation.org) and Surfrider Foundation San Diego County Chapter (www.surfridersd.org). This entry was posted in KAABOO DEL MAR, Press Releases. Bookmark the permalink.